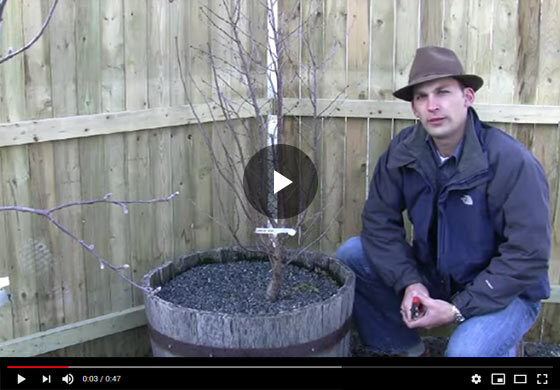 Gurney's horticulture expert Felix shows how to prune a bush cherry tree in the spring. Watch as he demonstrates how to tell the fruiting buds from the vegetative ones and prepares the tree for the upcoming fruiting season. Hello everyone, Felix here with Gurney's and I'm talking to you today a little bit about Carmine Jewel Bush Cherry, which is a wonderful new cherry variety from the University of Saskatchewan that you can get here at Gurney's, and we've planted this one in a whiskey barrel container for a patio or if you don't have a lot of space or good soil to plant it, you can put it in a container like this, and it's really the ideal volume for growing one of these bush cherries, soil in brute mass which is what you're going to be able to produce here, and this plant was three years old and growing quite nicely, you can see that we've drained it a little more. It's a small tree in this patio, where we're not initiating a number limbs real low, we're training it up a little bit and you can really focus this tree's growth any way you want to have it be within your landscape. Ours is as this little mini tree here, so to speak, and it's going to get probably another three feet of growth on it. The Carmine Jewel, they grow to about six feet tall and this one's, like, I said, only three years old, but we do have some fruit bud development on it already. So you can see her at the tips of these branches there's fat bud that's going to turn into flowers and as the season progresses versus these lower buds here, which are just vegetative in nature. We're going to get our first flowering season off of this Carmine in its third leaf year. This is early spring right now, there's one limb here in the back, it had a little bit of die back last season, it's also got some crossing over here, so it's not really serving our purpose, so we're going to cut it out to open up the framework here a little bit on this. Just taking this one limb out, everything else, there's a little stub cut here that's remaining, we'll cut that flush. Otherwise, it's looking great and we're looking forward to the fruiting season here on this Carmine Jewel, jut a idea of how you might be able to grow this if you don't have a lot of landscape space or if you want to have a fruiting plant on your landscape. Thanks very much, join us next time.